An ambulance outside of the Embassy Suites Hotel in Center City Philadelphia. 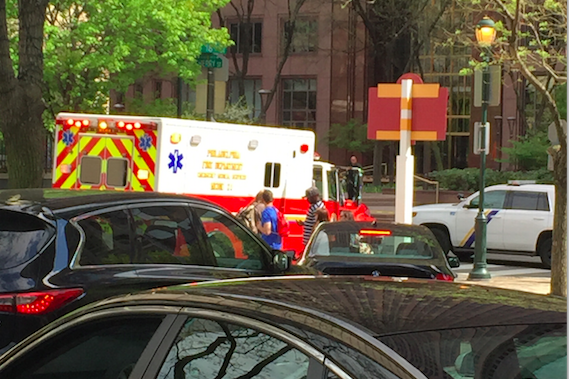 A man died of an apparent suicide Saturday afternoon after jumping off a 25th-floor balcony of the Embassy Suites Hotel in Center City, Philadelphia police officials said Monday. Police declined to identify the individual but said he was a 37-year-old white male. He did not leave a note and was pronounced dead at the scene at 3:23 p.m., just 12 minutes after the incident was first reported, police said. Management at the hotel at 1776 Benjamin Franklin Parkway did not immediately respond to a request for comment Monday.